DOES NOT CONTAIN ANY GPS, ELECTRONICS OR BATTERIES - SO HOW DOES IT WORK? Our tags are tough, waterproof and maintenance free! A dynotag's private information page is stored in our advanced, industrial strength cloud service. Once you ACTIVATE your dynotag using the code included in the package, it becomes yours. As the owner, you can update tag contents ANY time over the web and even secure information using password if you wish - others can only view what you choose to share at that time. Select the level of security you want, including password protection. Sign into your dynotag account to view detailed access records of your tag and even see the accesses on a dynamic map. GPS assist works using the electronics of the smartphone or computer viewing the tag: Any device viewing the tag content is requested by Dynotag service to report its location. Smartphones have detailed awareness of their location at all times, with GPS assist and other location services - so they can share precise location information if the user allows. All tag views and viewer location information is logged for the tag owner to privately review. If viewer does not share precise location, access time and IP address is still logged and location is roughly estimated. Check the dynotag service FAQ pages by visiting dynotag.com and clicking "help". time of view. Our advanced Dynotag Cloud Service (DCS) functions as the “brain” of your dynotag, working 7/24. 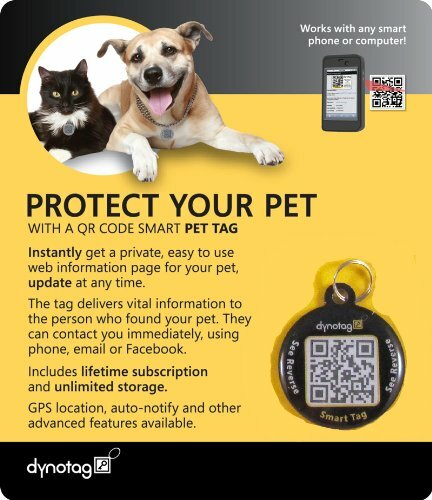 Visit help.dynotag.com for more information. When someone views your dynotag – location, if present, is added as a clickable link to open on Google maps. Developed in cooperation with Law Enforcement and First Response professionals. Use as a simple Emergency Info page – or upload text notes, pictures and a set of files with important information to share with First Responders! Memorable alias name assignment capability. A log book to let others add notes right on your tag!